It’s challenging to successfully recruit physicians and even harder for rural communities. 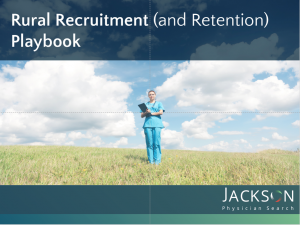 Let’s look at the current state of physician recruitment, address some of the challenges rural communities face, and dive into how you can improve your recruitment process. The Association of American Medical Colleges states the projected physician shortfall by 2030 is between 40,800 and 104,900. One factor is, though the amount of medical school graduates increases every year, there still aren’t enough residency slots. But, the biggest contributing factor to the projected shortfall is physician retirement. 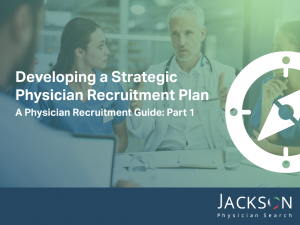 The current shortage makes it hard to recruit physicians and it will only get more difficult as the shortfall increases. According to the Health Resources and Services Administration and Rural Health Information Hub, access to medical care for rural communities is highly disproportionate. Approximately 20% of the population of the nation lives in rural areas but less than 8% of physicians practice in rural areas. That means rural communities have less access to basic medical care and specialist care. Additionally, the population of rural areas has a higher percentage of people aged 65 and older. 76% of physician candidates are considered passive. That means they are interested in a new position but not proactively seeking one. Using digital recruiting tools, you can consistently and effectively reach these candidates. Social media is a great place to start. 31% of all physician use social media for professional networking and over 70% of all U.S. physicians are on Doximity, a physician only social network. Leveraging email is also crucial. 95% of all physicians prefer to receive info about job opportunities via email. Treat an interview as a window to your organization’s culture. Personalize and strategize for every interview. To successfully make a connection you’ll need to tailor the interview team to each candidate. Explore their priorities and motivations to affirm that your community and culture matches well with their values. See how each candidate reacts to your organization’s vision and make certain they see the impact it has on the community. Get the candidate’s spouse and family involved. Show off the best aspects of your facility and enlist your community advocates to impress them. The best way to improve your process is to define benchmarks for each step of the process and work to improve them all. We use benchmarks for placements, time-to-fill, interviews-to-hire, acceptance rate, recruitment spend-per-hire, and retention to evaluate ourselves. By better understanding the steps in the recruitment process we become more efficient. Maximizing efficiency allows us to pay extra attention to quality and ensure that we place the right candidates in the right positions.